High Quality Content by WIKIPEDIA articles! 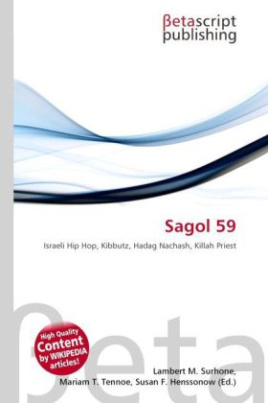 Sagol 59 (Born 1 October 1968) is a Jerusalem-based hip-hop MC. Raised on a Kibbutz in Israel, Khen Rotem took the name Sagol 59, or purple 59, from his personal Kibbutz laundry bag tag. After his required 3 year stint in the Israeli Defense Forces, Sagol turned to music, beginning his career in blues, funk and rock before moving on to hip hop in the late 1990s. Shortly after he relocated to Jerusalem, Sagol was picked up by the city's seminal (and now defunct) indie label, Fact Records. He appeared on the Israeli hip hop scene with his 2000 debut (Blue Period). He has done 5 full-length albums to date. He has collaborated with multiple artists. He has done multiple live shows in Israel and overseas (U.S, Europe).